For the umpire, for the opponent, for the scorekeeper, for your dugout - no matter where your line-up card goes, you will look like a big league team with your team logo and name a top your personalized line-up card. You have a choice. Buy the generic forms from the sporting goods store or have your own customized. Whether you are a high school, travel, college, pro, or recreation team, lineupCARDS.com can design and print the line up card for you! 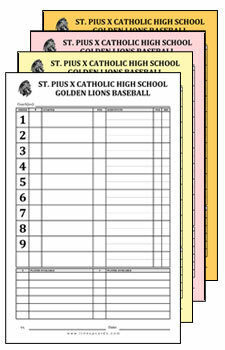 You can find the quantity that your team or league needs on the lineup cards and dugout cards pricing & quantities pages. Who uses our lineup cards and dugout cards?